This lovely hand crafted ornament was designed to commemorate Girl Scout Daisy's 30th Anniversary. Double sided tri-metal with Girl Scout Daisy and multi-colored beaded petal. With hook for hanging. Brass/copper/nickle. 1 3/4" x 8". Imported. Decorate for the holidays with this beautifully crafted glass Christmas tree, accented with tiny, removable ornaments and a glittering star. Sent in a protective gift box. Please choose size from the drop down list. Available in several different ornament styles; we'll select. 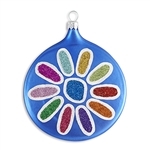 Deck the halls with this striking Daisy glass ornament. Two sided with colorful daisy petal design one side and "Girl Scout Daisy 30th Anniversary" in silver glitter on the other side. 3 1/2" round flat disc-shaped ornament. Imported. Red and green jingle bell bracelet. A thick, red knit hat with white trim and a white pom pom on the top. Matching scarf sold seperately. This adorable snowman figurine will fit nicely in your home for the holidays! Made of Polystone 2.4" Wide X 5.5" Tall. Comes in two different styles. We'll select. Oh no! 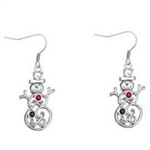 The sun is out and these little snowmen are melting!